On March 8, more than 100 campus teams will spend 24 hours raising money for projects at UC Santa Cruz that range from the Treehouse Childhood Cancer Initiative and Environmental Art Exhibitions to Climate Action Champions and the Farm & Garden. Giving Day 2017 builds on the success of last year’s event, when nearly 3,000 donors came together to collectively give $340,000. The givingday.ucsc.edu site will go live at 12:01 a.m. on March 8 for donors to make gifts and track their favorite projects in real-time. Before then, visitors to the site can preview projects and find ones that mean the most to them. Projects are grouped in categories that reflect the diversity of choices, such as Environment & Sustainability, Diversity Outreach, Scholarships, Social Justice & Activism, Community Ties, Arts & Letters, and Athletic Teams. Incentives to give on March 8 include matching funds for specific projects, and challenges throughout the day to reward project teams that attract the greatest number of donors. All gifts will count toward the Campaign for UC Santa Cruz, which is entering its home stretch. Leading up to Giving Day, teams have begun reaching out to supporters, sharing videos and details of what donor gifts to their projects will accomplish. Many projects are student-led; all benefit students. Teams that advanced their work after connecting strongly with donors last year include the Bird School Project, Formula Slug, the Arboretum, and Gail Project. Each is among the many returning entries – and scores of new ones this year. 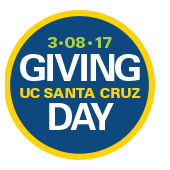 An event page on Facebook, and the hashtag #give2UCSC are among social media tools being used to help spread the word about Giving Day projects. Campus events on day-of are planned for Quarry Plaza and at OPERS.